10 Safety Features. At first, I wondered if some of the safety features were entirely necessary, but then I went to a friends for a home-cooked chutney chicken. She had a regular pressure cooker and every time it made a sound, she looked so jumpy-I’ve never once questioned it since. 14 Smart Programs. It’s also essentially seven cookers for the same price (and the space) of one. That’s a bargain to me. What Can an Instant Pot Accomplish? There are many different models of the Instant Pot currently available and these models also come in different sizes. Some have Bluetooth capability and can be controlled via an app on your phone. This pressure cooker might not have all the bells and whistles as others, but it is still a contender. The 7-in-1 has several functions all with their own buttons on the front of the Instant Pot. If you aren't at all familiar with how a traditional pressure cooker works, then you might need to research a bit more before just jumping into the Instant Pot world. There are several advantages to using a pressure cooker like the Instant Pot for your meals. It offers the same results as a slow cooker, only it completes the task in just a fraction of the time. Need to get a quick dinner ready? The Instant Pot is the ideal solution and one of the best kitchen appliances for the job. However, when timing your meals, you need to remember that there is a cooking time as well as the time it takes for the appliance to build up and release pressure. It can take approximately ten minutes for the Instant Pot to come to pressure depending on how much you are making. The difference between the Instant Pot coming to pressure and an oven preheating is that the food must be inside of the Instant Pot during the pressurizing process. 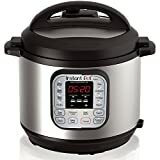 The Instant Pot IP-DUO60 7-in-1 Programmable Pressure Cooker offers many features such as its ability to be a multi-functional cookerpressure cooker, slow cooker, rice cooker, sauté/browning, yogurt maker, steamer and warmer. This Instant Pot model also features 14 built in smart programs and an automatic keep warm feature that can keep your food warm for up to 99 hours. Retailing around $125 (see best price), it is one of the more affordable electric pressure cookers on the market. The IP-DUO60 is also UL and ULC certified with ten proven safety mechanisms and built to North American Electrical Standards. It’s kitchen friendly and, even when cooking, the external environment undergoes no minute temperature change, meaning that it’s safe for all of the family – not to mention fingerprint resistant when any inquisitive little hands want to touch the “shiny thing” that has just come out (looking fabulously clean) from the box. But just what makes the Instant Pot different from other appliances? The answer to that is both simple and complicated: the complex third generation technology is an embedded microprocessor that constantly monitors and adjusts temperature and pressure levels constantly, however the basic reason that it is so effective, are the positive results that came out from the HUNDREDS of lab tests, put simply, the IP-DUO60 is tried and tested. Its multi-functionality lends itself perfectly to a healthy, balanced lifestyle – a deficiency in dairy? No problem, you can make yoghurt or even pasteurize milk. You might want to eat a healthier porridge but it always seems to be a mixture between half-raw and burning? Not with the Instant Pot IP-DUO60, you can even set up your porridge the night before and the automatic Keep Warm function means that you get it served “just right” again and again, day after day – a needed boost before delivering that important proposal. Thanks to the fact that the IP-DUO60 can be safely left unattended, you can double-check that everything’s right for the next day instead of anxiously watching the soup that looks as if it’s just about to bubble out of the pan, not to mention what sautéing that green pepper filled chicken steak will do to your painstakingly ironed outfit. Well, the IP-DUO60 even has three different settings for sautéing, so you can stand back and let the Instant Pot work its magic (I know I’m relieved that I don’t have to pray that half of my meal won’t end up on my shirt any more). Not only is it fast (meals cook in it 2-6x faster) but it’s also incredibly efficient, using 70% less energy than other comparative cooking methods – no matter what meal I plan on eating later on. The Instant Pot IP-DUO60 also, I’ve found, has three different sounds: one for opening the Instant Pot, one for closing it, and one for removing it completely and placing it into the convenient slots on the side of the pot, so I know exactly what I’m doing when I’m making a healthy meal. The recipes taste great and I feel tons better to know that I’m managing to eat well at the same time. Easy one touch controls make setting the Instant Pot easy and straightforward. Simply press a button for the desired action and you are good to go. Always receive consistent results because of the built-in microprocessor that effectively monitors the key functions of the Instant Pot. This feature allows you to create simple and delicious meals that are healthy and quick. With Alexa guided cooking through the free app that is offered, you can find easy to follow get started videos, a recipe book with a list of some favorites, a personalized grocery list, and so much more. The dual pressure settings of this Instant Pot allow for fast and flexible cooking. High pressure cooking allows for reduced cooking times and it helps you avoid overcooking your food as well. The adjustable temperature settings allow you to sauté, sear, and simmer so you can also have the benefits of a slow cooker combined with the speed of a pressure cooker. The cooking pot, steam rack, and lid are all made from food grade stainless steel. The exterior is brushed with stainless steel, is fingerprint resistant, and the lid is suitable for both left and right handed users. If you’re in the same place I was two months ago, in an endless rush, really striving for that healthy lifestyle but you never seem able to fully follow through with the plan you set out, then purchase the IP-DUO60 and don’t look back. There’s only one pot to clean and the food is always kept warm, delicious, and ready for you when you come home, what more could you ask for? Since I had moved out on my own, into a loft (not very big), I have very, very limited kitchen space. My parents bought this for me….and I absolutely love it! And the food that comes out of it….oh my gosh! My boyfriend thinks I spend hours “slaving in the kitchen”. I hardly ever use the actual stove or oven. I love my InstantPot Duo! What is the difference between the Instant Pot Duo 60 and the Instant Pot Lux 60? Hi George. The main difference is the DUO60 is a 7 in 1 cooker while the LUX60 is a 6 in 1. The DUO60 allows you to make yogurt….which for some people is really important. There are a few other bells and whistles included in the new model (DUO60), but overall they are similar. Do you know if you can buy additional inner pots in non-stick for the Instant Pots? Yes, you can buy them on Amazon here. I own a 6 quart electric Pro Pressure Cooker , I have cooked meat,soups ,stews and gravies quite successfully following the supplied recipes book and at times I vary the cooking time. However vegetables cooked with meats come out too mushy and I now resort to the stove and cook them in the usual way. The supplied recipe books do not explain this clearly enough. Apologies if I have sent you this complaint before. Why are the Instant pots made in China, then shipped to Canada. Then shipped to us from store. I am waiting for my instant pot. Why can’t Canada or USA make the instant pot. Check them out on Amazon…best prices in my opinion. I would like to get an 8 qt cooker for my son. Can he do canning in this pot? He can not can (beans, etc.) in this! Please be aware! Make sure you realize you can not can in this!!! It is not safe for pressure canning!!! !